A review in 10 words (or thereabouts): The not quite Friday Night Lights. Lauren is the new girl in town with a dark secret. Colby is the football hero with a dream of something more. In alternating chapters, they come together, fall apart, and build something stronger than either of them thought possible -- something to truly believe in. So I thought this was a novel-in-verse. And then it wasn't. But then it was again. And then I had to take a moment to regroup. What exactly am I reading, and how can I reconcile free verse and prose together in one story. I'll be honest; it wasn't easy. It might have been easier if Lauren's voice (which was mostly verse) stayed consistent. Lauren is a troubled young girl. The blurb above says she has a dark secret. Truth be told, her secret isn't that big, and it isn't that dark, but for some reason, when she talks to her therapist, she speaks to her in prose. The rest of the world gets bare bones verse. Colby, on the other hand, has a consistent tone throughout the book. It is maybe a little too consistent at times. The back and forth puts a barrier up between the characters and the reader. You never really get a sense of who they are. Schroeder does a nice job of showing you what they're facing, but who are they? What are they like apart to make what they have together special? The secondary characters felt much the same way. We get snapshots of who they are, but we never get to know them. Lauren has an amazing Aunt and Uncle and nieces and nephews that she falls in love with, but why? We get glimpses of them welcoming her into the family, but not enough for the heart tugging need for her to stay at the end. Colby has great grandparents who linger on the sidelines and a coach that preaches "I believe," but why should we believe him. What kind of man is he? Why should we expect those two words to mean so much to a team, a town, at the end of the story? I really wanted to like this one. When I started reading it I got really excited because it felt like the high school movies I'm strangely addicted to. I figured it would be a little predictable, but those stories always resonate with me on some level. Everyone wants to be beautiful. Everyone wants to be loved. It's the inside that counts. I know. Cheesy. But it's a feel good cheesy I can get behind. 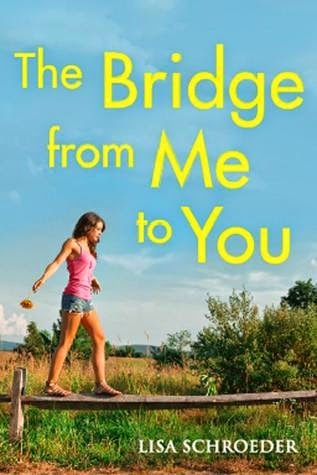 The Bridge from Me to You came off a little more Hallmark. Everything was too tidy and clean. The dialogue seemed a bit forced at times, and in the end, I wasn't really sure I liked any of the characters. The potential was there, but I just think this one fell a little flat. I've read some other Lisa Schroeder titles, and I highly recommend her. If you like variety in format and changing perspectives, than maybe you should give this a try.